This is part 10 of a 31-part posting of my journal entries and photos from one of the greatest experiences of my life so far--a month-long mountain climbing trip to the Atacama Desert area of northern Chile and Argentina, which included summiting three 6000 meter peaks (~20,000 feet). To view all the entries in this series, check the posts labeled South America. I fell asleep quickly and slept like a rock until 4:35AM when I woke up and began thinking about the trip. The leg of flights I’m taking today and tomorrow is convoluted and long, yet it just takes me to the other side of the same mountain. In retrospect it seems stupid and wasteful. At the time I couldn't figure out a better way. Here's the situation: I had spent the past several days based at Paso San Francisco. The expedition I was now joining would spend its first night camping at Cazadero Grande less than 50 miles down the same highway. I left Paso San Francisco Wednesday morning, and the expedition's first night of camping would be the coming Monday night. I could have walked there. Ten miles a day. Well, except for the fact that I had tons of luggage. But what I did was drive, ride, and fly 2,300 miles!!!!! Twenty-three-hundred miles. Today's itinerary covered most of those miles. I would drive my Rental car to the Copiapó airport, take a domestic flight from Copiapó airport to Santiago airport, then an international flight from Santiago to Cordoba airport in Argentina, then finally a domestic flight from Cordoba to Buenos Aires domestic airport (different from their international airport). Tomorrow I would fly from Buenos Aires to Catamarca where I'd meet my expedition leader John Biggar. John is very familiar with and very well connected in this high desert area of northern Chile and Argentina. He's run expeditions here every year for decades. If I had only thought to ask him about connections I'm sure he could have made one. Even on my own, at the last minute, as I checked out of my hotel this morning, I learned that a private auto transport service based right outside my motel could have driven me to Catamarca for $140. But I had a flight package booked, and cancelling one leg of it is not possible. If you do not physically show up in your seat on the plane, all the remaining flights on the rest of the reservation are automatically canceled -- all the way back to the US. After learning that, and after mentally kicking myself around the lobby a few times, I checked out of the hotel at 7:25 and hit the airport by 7:45. It was a little nerve wracking there because nothing was open at first, then when the airline counter opened five minutes later, they said I had to pay extra for luggage that was overweight. Then they had trouble with their system taking my payment. Meanwhile I asked at the information counter and found that the rental car desk wouldn’t open until 8:30 and that’s when my flight would begin boarding. Well, it all worked out even though the rental car booth actually opened at 8:35. By then I had paid the extra luggage charge successfully. I went through security and boarded in plenty of time, though I was among the last couple dozen people to board. The flight was a quick easy hour to Santiago and I had a window seat facing east toward the Andes mountains. 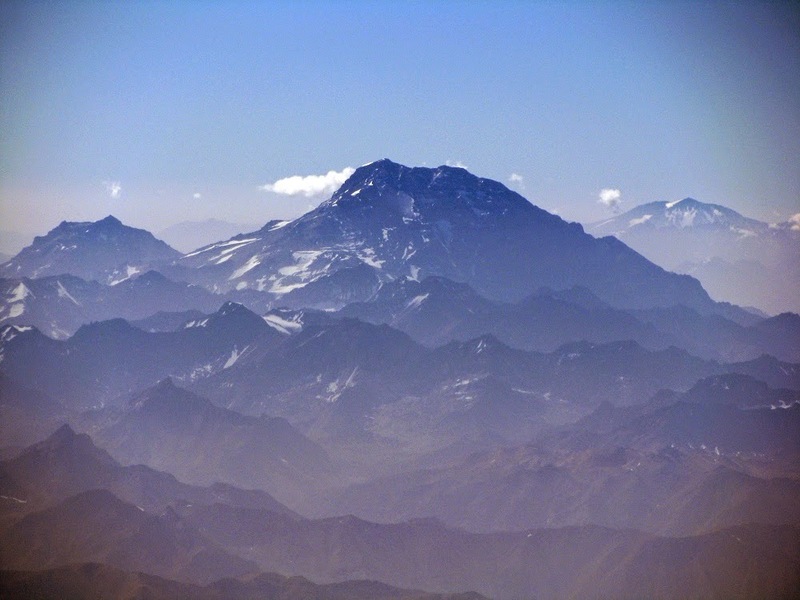 I got plenty of great views of those majestic peaks, including Aconcagua, the highest mountain outside the Himalayas, and just 222 feet higher than Ojos del Salado, the second highest, and the one my expedition was here to climb. At Santiago I had four hours layover. I waited at the baggage check to be sure my baggage wasn’t there, as promised. It was supposed to go straight through to Cordoba, Argentina where I’d have to pick it up and take it through customs. I wandered around the airport and found a Ruby Tuesday restaurant where they have wifi access if you buy something. I arrived there before my departure gate was assigned, but in the huge terminal it turned out that my gate was directly across from where I was sitting! I had a huge lunch and surfed the internet until boarding began at 2PM, then packed up and boarded the flight to Cordoba, Argentina. It was a quick eventless flight over the Andes and then across some interesting rugged bare rock and grass terrain west of Cordoba, a small city that is known to me only as the home of professional golfer Angel Cabrera. It’s pretty and green, at least now. The Cordoba airport is fairly small and quiet for an international airport, but very modern. I had a three hour layover and so after going through immigration and customs, with my baggage securely in hand (yay!) I killed the time in a spacious coffee shop that fills a quarter of the floor space of the departure floor, yet they sell only a few basic items. There was internet available to buy, and there was an on-line credit card option to buy, but it asked for an ID number (like a personal identification number? - inscrutable to me) so I couldn’t buy it (I thought). My computer was running out of batteries anyhow, so I just caught up on my personal journal and then got off the laptop at 5:15 and waited for the earliest possible time to check in my baggage, promised to be at 5:30. It was more like 5:45 when I checked my bags then went through the deserted security area--I was the only one in sight. Security is much simpler and more relaxed here in South America. I found my gate and had an hour to wait and found an outlet and also decided to give buying internet service one more chance. I used my passport number and it worked! I had only half an hour to surf, but should also be able to use the same service in Buenos Aires. I bought an Argentinean Stout beer in a bottle near my gate and browsed and posted on Facebook to 6:55 then got ready to board. Again I boarded late, and this time the overhead bins were full. I had to stow my bag 16 rows further back than my seat. The short flight was enjoyable because of the geography lesson. It’s as flat as SW Kansas between Cordoba and the coast. But it’s greener and probably more tropical. Approaching Buenos Aires I got a view across the big river and wetland to Uruguay. 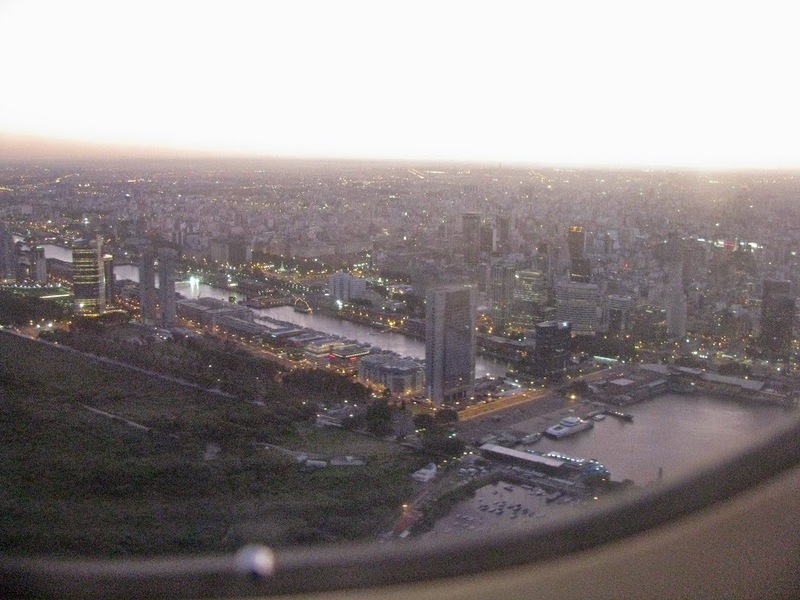 Then the plane made a big turn over the Atlantic and I got a great view of the center of Buenos Aires as we landed right after sunset. The best of the photos I shot headlines this post. We landed at 8:30. I’d decided to just stay and ‘camp’ in the airport for the night and save the hassle and expense of taxi, check in, short sleep, taxi, return by 8:30 or 9AM for a 10:40 flight. The cheap hotel I made a reservation for might not have internet, but I wouldn’t have as much time to use it anyhow. Plus I took the time to buy a small dinner in this big airport’s nice food court. A small section by the window across from the food court has a special raised floor (for concerts?) where there were abundant outlets and tables and chairs set up for food court customers. I camped there with my cart full of luggage and got on the internet and used up the rest of the two hours I bought for about $6 US back in Cordoba. That was done right about midnight. By then I was feeling pretty drowsy. I put my head down on the table and tried to sleep.